The Farepak debacle could have been lifted straight from the pages of a Charles Dickens novel. For a year, 116,400 of the country's poorest families had been putting aside a little bit of cash, saving up for Christmas. Unbeknown to them, Farepak, the savings club they were squirrelling their cash into, was in serious trouble. The company had run out of money to buy the vouchers customers had paid for and faced collapse unless it could get some emergency funding. Farepak's bosses, who included Sir Clive Thompson, a former president of the CBI employers' organisation dubbed "Mr Twenty Percent" for his growth record as chief executive of Rentokil Initial, were desperately looking for help but failed to find the funds to stay afloat. Every solution the directors proposed – including the firm's major shareholder writing down the value of its holding to zero – ultimately failed, because Farepak's main lender, HBOS which is now part of the bailed-out Lloyds Banking Group, was in the words of the high court judge investigating the collapse, "playing hardball". "HBOS was not prepared to provide any significant positive assistance to solve the difficulties the group came into," the high court judge Mr Justice Peter Smith said in a statement in open court: "The reason for this was because at all times from the commencement of the troubles HBOS was fully secured and, as was shown in the outcome in October 2006, did not lose anything." 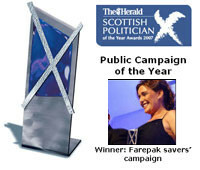 The judge said Farepak could probably have been saved if HBOS, under the then chief executive Andy Hornby, had lent it an extra £3m-£5m. But, the judge said, it was not in the interests of the bank to save the company and protect the savers. In fact, the judge said, HBOS "substantially benefited from deposits that were received late in the death of the companies in September/October 2006". "The bank had, as I have said, almost a pride in their strong attitude, but they went beyond that of course because they in effect forced the directors to carry on in September/October collecting deposits … at a time when they believed [the bank would go bust]." The judge said it was a "tragedy" that savers lost their hard-earned money, while the bank benefited to the tune of £10m – £4m of which came directly from savers' deposits when Farepak was careering towards an inevitable collapse. While HBOS has done nothing illegal, the judge questioned the bank executives' morals and implored them to make a further "substantial payment" to the victims, who eventually received back only 15p for every £1 they had given to Farepak. A spokesman for the bank said it had made "entirely reasonable decisions" based on information available at the time but said it would "consider" the judge's comments. The most striking element of the dramatic events in court 26 of the high court's new Rolls Building was that it was not HBOS, but Farepak's former directors who had been standing trial. Vince Cable, business secretary, had asked the court to ban the former Farepak bosses from being company directors for up to 15 years. The case against the directors collapsed when it became clear that the company's former bosses had done everything in their power to save the firm but had been frustrated at every turn by HBOS. The judge rounded on Cable, and the Insolvency Service, which brought the case, for relying on lengthy witness statements that were unfairly "slanted against the defendants". Smith said witnesses were forced to retract crucial evidence when it became clear they did not understand – and in some cases did not appear to have read – their statements. He also criticised the length of the some witness statements, some of which ran to 700 pages. It is the second time this week that the government has been forced to abandon a high-profile case after the Serious Fraud Office dropped its 15-month investigation into the Mayfair property tycoon Vincent Tchenguiz on Monday. The collapse of the Farepak case is likely to cost the taxpayer about £20m in legal fees. A costs hearing will be heard next Friday but the Insolvency Service is expected to be asked to pick up the bill for the legal costs of all the parties, except those of Lloyds. The taxpayer could face the prospect of further multimillion-pound payouts in the future as Farepak's former directors are understood to be considering suing for damages to their reputations and loss of earnings. Thompson told the Guardian that he also plans to sue three MPs, including the former cabinet minister Jack Straw, for defamation after they publicly attacked him over Farepak's collapse. Shortly after the collapse Straw branded Farepak's demise a "truly scandalous situation" and said: "The more we find out about it, the more – bluntly – it stinks". He is also considering suing Jim Devine, a former Labour MP sentenced to 16 months in prison for expenses fraud, who branded Thompson the "unacceptable face of capitalism" and Anne Snelgrove, who called him a "modern-day Scrooge". Think you were on holiday when I first posted that one - its on page 14 of this thread, they have edited it since to include the bit about Jim Devine. The boss of the company behind Farepak, the Christmas hamper savings group that collapsed eight years ago, has been accused of deliberately misleading his fellow directors and masking a financial vulnerability that left more than 100,000 customers unable to get hold of their savings before the festive season. The latest attempt to hold bosses to account for one of Britain's most infamous corporate scandals comes from the Financial Reporting Council (FRC), which is responsible for enforcing disciplinary matters covering the accountancy profession. It has powers to impose heavy fines on William Rollason and even strike him off. The FRC's intervention will come as a surprise to many Farepak campaigners as a high court judge this summer delivered a savage attack on business secretary Vince Cable for seeking – and failing – to have Rollason and other directors struck off. "Not only did the directors do nothing wrong," Mr Justice Peter Smith said, "but they made genuine, strenuous efforts to save the group and the depositors." Formerly the chief executive of parent group European Home Retail (EHR) as well as a director of Farepak, Rollason will vigorously contest the FRC allegations. A tribunal hearing is expected in the new year. His lawyer, from DAC Beachcroft, said the allegations against Rollason had been tested before Mr Justice Peter Smith, who gave an "express and very clear complete exoneration" of them all. • Wrote and distributed a memo that he knew to be misleading to fellow EHR directors detailing the company's financial position in February 2006. • Days later signed a letter on behalf of EHR stating that the company would continue to support Farepak to enable it to meet its liabilities as they fell due, knowing this to be misleading. • Signed the financial statements of Farepak knowing that they contained misleading assertions about the financial undertakings EHR had given to support the company as a going concern. The FRC is determined to bring the accountants involved in the 2006 scandal to book. As well as pursuing action against Rollason, last month it filed a formal complaint against Farepak's auditors, Ernst & Young, and the accountancy firm's former senior partner, Alan Flitcroft. The auditors allegedly failed to properly consider Farepak's ability to continue as a going concern. These accusations are contested by Ernst & Young and Flitcroft. Swindon-based Farepak took deposits of between £35m and £41m from more than 100,000 customers – many of whom were women on modest incomes – between January 2006 and the group's collapse eight months later. Savers believed they would receive hampers or vouchers that they could use for Christmas gifts. Company literature had told them: "As one of the founding members of the Hamper Industry Trade Association, we adhere to the HITA Code of Practice to ensure the security of your savings and the safe delivery of your hampers and gifts." In the end, they got almost nothing. Instead of being ringfenced, their deposits had been swept up on a daily basis by parent group EHR, which had large debts to Bank of Scotland, now part of Lloyds Banking Group. As a result, Farepak became an unsecured creditor of EHR. Earlier this year Rollason and eight other directors all challenged the disqualification action, and halfway through the trial, Cable dropped the case – leaving his department's actions heavily criticised by high court judge Mr Justice Smith. Four years ago liquidators from BDO launched legal claims against the directors. These resulted in an out-of-court settlement under which £4m, including legal costs, was paid to BDO without directors admitting liability. The sum recouped for Farepak savers was further improved in the wake of this summer's failed director disqualification trial, when Bank of Scotland's parent Lloyds Banking Group – heavily criticised by the judge – agreed to make an ex-gratia payment of £8m to the liquidation process. This was on top of an initial £2m payment to the compensation fund. Mr Justice Peter Smith said the bank had not only resisted requests to ringfence funds, but had encouraged the group to continue taking deposits when it knew Farepak was in serious trouble. "The bank had, as I have said, almost a pride in their strong attitude, but they went beyond that, of course, because they in effect forced the directors to carry on in September/October collecting deposits … at a time when they believed [the bank would go bust],"
Bank of Scotland's ex-gratia payment came after it received a furious letter from Cable, demanding a response to the judge's remarks from the now taxpayer-backed bank. BDO has as so far recouped 32p in the pound for Farepak savers, while the government-established Farepak Response Fund has added a further 17.5p in the pound.